Beyond their roles of broadcasting programmed content into the homes of people around the country, Britain’s British Broadcasting Corporation and Independent Television stations delivered additional content via home television sets. This article will explore the history of British teletext and telesoftware in the broader context of microprocessing developments during the late 1970s and early 1980s through a media archaeological framework of the terminology and traits. Situating these developments in the industrial and political climates of the 1970s, the article will outline an alternative history of networks through the aerial, as the ‘hidden lines’ of information become exposed once again. Television as new media is the subject of Sheila Murphy’s book How Television Invented New Media, in which the author argues that TV today is “a deeply digital, interactive device mediated by the manipulation of both hardware (the remote) and software (the onscreen guide to the TV’s settings and the program guide for navigating content).”3 For Murphy, television’s newness is partly dependent on the recent integration of programs and applications into its infrastructure. While it is broadly acknowledged that software is a central component of current television technologies, the role of software in TV before the current digital age is less recognized. As Manovich notes, “We live in a software culture – that is, a culture where the production, distribution, and reception of most content is mediated by software.”4 However, software culture is not only a fact of the present day. Software cultures have a longer history linked to computer hardware, production, and use: television’s convergence with software cultures dates back to the developments of microcomputing technologies in the 1970s and 1980s. Whereas the Internet and connectivity are often discussed in terms of the ‘network society’ that supposedly emerged in the 1990s, scholars such as Jay McKinnon have noted earlier instances of convergent media.5 From a European perspective, it can be seen that traits of what is now described as the smart television set can be traced back to the late 1970s and early 1980s and the development of interactive videotex and viewdata. 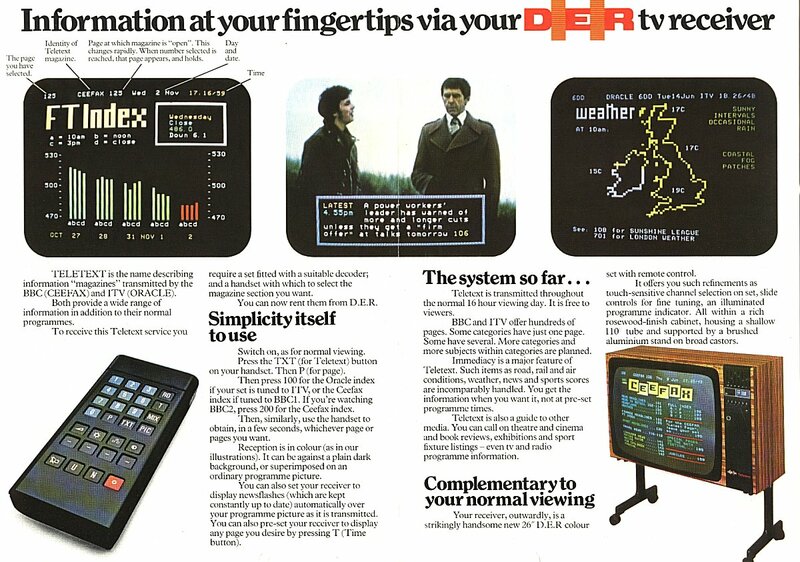 In Britain, interactive videotex services were introduced by the Post Office and, subsequently, British Telecom through their Prestel service. Prestel was a two-way interactive system that enabled people to connect to information databases via their telephone service and a dedicated terminal or adapter; it was also possible for users to make bookings through the system for theatre tickets, holidays, and other services. The histories of these videotex and viewdata are discussed in the work of Susanne Schmidt and Raymund Werle, Jerome Aumente and Richard Veith, in which they are also studied in relation to the teletext services that are offered globally.6 In contrast to videotex, teletext services provided one way communication, available via the user’s television aerial and a compatible TV set, or by connecting a teletext adapter to the TV set. As recognized by Schmidt and Werle, “the UK’s lead was significant” in relation to both videotex and teletext services.7 However, what many of these histories miss is how these services were marketed and used by the public, as well as how they were placed alongside other, more localized developments in the history of technology. This article examines the history of teletext and telesoftware in Britain and discusses in particular the terminology employed for marketing, producing and using teletext. It draws from advertisements for teletext adapters and a range of magazines that focused on the role of domestic computers in the 1980s. The sources reveal how these technologies and services were operated in relation to other media and uncover uses of teletext in the form of downloadable telesoftware programs. The use of telesoftware was enabled by Britain’s increasing developments in microcomputing during the late 1970s and 1980s, which led to the production of machines such as the BBC Microcomputer and the ZX Spectrum (see Figure 1). Fig. 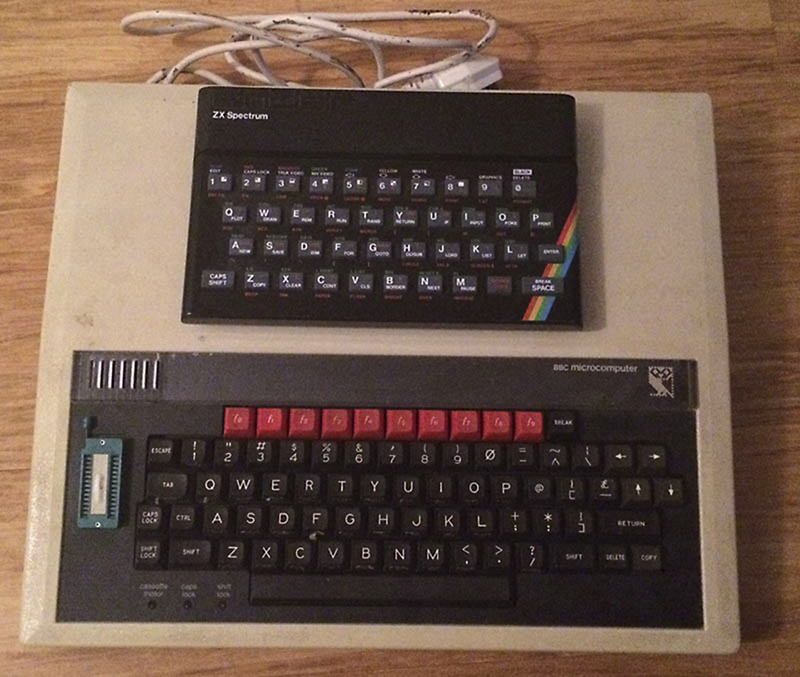 1 ZX Spectrum (top), BBC Microcomputer (underneath). In their introductions to the field of media archaeology, Parikka and Huhtamo reference the need to highlight ‘alternative’ histories of media discourse by examining the ‘suppressed’ or ‘neglected’ histories of media’s past in relation to their future constructs.8 By tracing developments in teletext, and subsequent telesoftware services, we can discuss these often ‘neglected’ technologies that play a role in the histories of networked information. By situating some of these developments in the industrial and political climates of the 1970s, this article thus outlines an alternative history of networks through the aerial. The outcomes of these findings are situated in a wider academic discourse about new media technologies and convergence cultures to show the cycles of media distribution offered by a media archaeological approach. The information offered on these pages included football scores, flight arrival details, stocks and shares, and television listings. A winter edition of the Eng Inf quarterly publication for BBC Engineering Staff details how, “It was Peter Rainger who, as Head of Designs Department, first laid the framework of the Teletext system in 1970 and became one of its co-patentees in 1972.”11 This was later taken over by John Chambers, the Head of the Special Projects section, who was the author of the teletext technical specification published in 1976. Following the BBC’s initial developments in prototyping the teletext system, it was decided in 1972 that further consultation with industry and support from ITV would insure the future success of the project. Richard Veith relates that “a committee comprised of representatives from the BBC, ITV, the semiconductor industry, and the television manufacturing industry was established to design a suitable system standard.”12 These discussions resulted in the BBC developing a teletext system titled Ceefax (‘see facts’) and in ITV producing its own version titled ORACLE (Optional Reception of Announcements by Coded Line Electronics). According to the online Teletext Museum, it was in 1975 that the first teletext subtitles were displayed by Ceefax. However, teletext was not used much by the public until 1977 and later, when interest in the system picked up. Users had to either rent or purchase a new television set or buy a separate teletext decoder that could be used to access teletext information, such as the one shown in Figure 2. Fig. 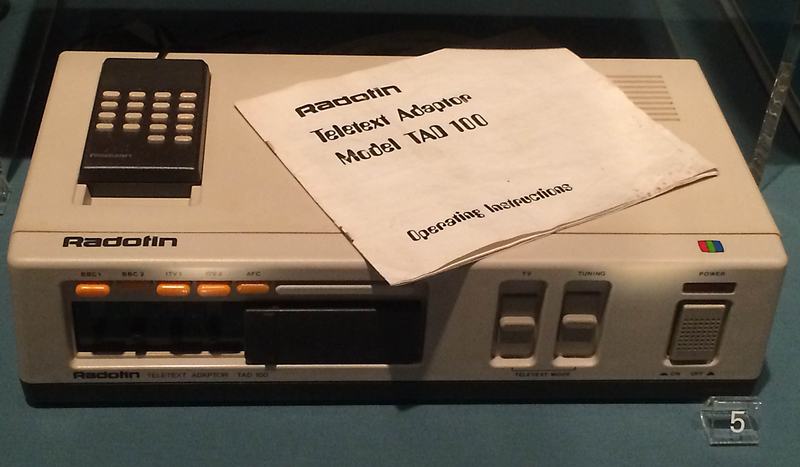 2 Radofin Teletext Adapter Model TAD100 on display at the National Media Museum in Bradford, UK. Although the television rental model facilitated the growth of teletext, manufacturers and the specialized press advocated the service’s dissemination by referring to established (print) media. This remediation of vocabulary had the explanatory function of allowing the public to understand how to use the service. Using the term ‘page’ for teletext helped people understand the structure of the system by comparing it with older media, in particular books and magazines.21 Similarly, the notion of the ‘magazine’ was recycled to describe a ‘group’ of 100 teletext pages, with a total of eight magazines being available for each broadcast channel.22 By referring to the magazine, the makers of teletext encouraged audiences to understand the new technology through an analogy with previous media forms—implying that teletext’s information pages functioned like print-based equivalents. This choice of terms in relation to the teletext page was outlined in an advertisement leaflet for a D.E.R receiver. Explaining the basic components of a teletext page, the advert underscored the system’s rapidity to access new content enabled through the magazine structure. In contrast to the static printed page, all teletext pages were broadcast in a constant cycle. If a user dialled up page 10, he or she would have to wait for that page to come up in the cycle to be displayed on the television screen. Teletext pages would cycle every 22 to 25 seconds per 100 pages, depending on the amount of data available in each magazine. Pages were not necessarily cycled in numerical order, and therefore, the company could broadcast the most popular pages in bunches within the cycle to allow them to be accessed more quickly. Both Ceefax and ORACLE succeeded in allowing viewers to interact with the system to find out the latest sports and news headlines, extending the possibilities of the broadcasters’ capabilities before on-demand viewing and 24-hour news channels became widespread. This “immediacy” was highlighted in the D.E.R. advert as a “major feature of Teletext” that allowed users to “get the information when you want it, not at pre-set programme times.” Users could call up flight arrivals before heading to the airport to pick up relatives, and although it was not as instantly updatable as Internet-based content, the interaction with linked information streams enabled users to gain another pathway to information beyond scheduled television content. Terms included those such as ‘database,’ which were explained further in issue 6 of The Home Computer Course. Using the example of teletext, the article states how “the Ceefax service on BBC1 and BBC2 and Oracle on ITV channels gives you access to a wealth of miscellaneous information, which is stored on a computer ‘data base’. This is continuously updated so that the latest developments in news, weather, sport and even stocks and shares are instantly available at any time.”28 For Manovich, the ‘database’ is one of the key identifiers of new media forms.29 Once again, we are reminded how television services that were connected to technologies of the 1980s were also situated with the ‘new media’ content of the time. Similar examples in The Home Computer Course continue to show how the television was seen as a convergent technology or a ‘new media’ form. This time, the television and the VCR are discussed within the magazine as a way of explaining microprocessors and microcomputers. Microprocessors are discussed as being part of televisions in order to “provide very stable control to the colour television circuitry.”30 The example highlights how there was a need to educate the public about microprocessors by explaining how they were already being used in commonly known technologies such as the television. The article’s reliance on showing the role of the television in relation to other home technologies such as the VCR once again highlights the importance of understanding the growing convergence of these technologies. This convergence of technologies and services was explored further through the development of telesoftware. The term ‘telesoftware’ was coined by W.J.G. Overington in May 1977 to mean ‘software at a distance’ and was used in reference to transmitting programs via teletext services.31 Experimentation with telesoftware as a means for creating smart television sets was subsequently conducted in the late 1970s to see what this means of transmission could offer.32 However, it wasn’t until the 1980s, with the arrival of microcomputers, that the public started to see how telesoftware could be used. Both the BBC and the Independent Broadcast Authority (IBA) experimented with telesoftware via Ceefax and ORACLE teletext services. Already playing a central role within domestic space, the television set was often used as a display for an attached microcomputer. Consequently, it could act as part of a group of connected technologies that allowed users to download content. Instead of buying software on a cassette tape or floppy disk, the television audience could use existing teletext services to download content via their television sets and microcomputers, such as the BBC Microcomputer or ZX Spectrum. Telesoftware was not unique to teletext because it was also integrated into Prestel systems at the time, but the ability to download programs via the aerial instead of a telephone line came at a relatively low cost because additional telephone connection charges were not required. Telesoftware programs were free to download once users had access to a teletext adapter for their microcomputer. Much like the earlier teletext adapters for television sets, teletext adapters for microcomputers allowed users to access teletext services through their machines as well as the television set. Once it was purchased, the teletext adapter was connected to the television aerial in order to receive teletext content. By plugging the teletext adapter into the microcomputer attached to a televisions set, the user was able to request teletext pages as he or she would on a teletext-enabled television. In combination with the adapter, the service now offered software to be downloaded by accessing the relevant teletext pages. By connecting the adapter to a microcomputer, the software could be used immediately or saved on a cassette tape or floppy disk to use at a later date. However, the current television sets did not have to have teletext capabilities because the external adapter allowed for access to the service. One such device to have a teletext adapter was the BBC Microcomputer. The corresponding teletext adapter was available just over a year after the machine’s initial release in 1981. The public’s interest in teletext adapters and telesoftware services can be tracked through the letters sent to BBC magazines during the time, especially to the Acorn User magazines. One reader in the letters pages of the magazine writes in to ask whether the teletext adapter for the BBC Micro would allow him to use teletext services even though his current television set did not accept teletext transmissions.33 The reader further wanted to know whether he could run telesoftware programs without having to type them in. The ease of using of BBC Micro’s teletext adapter was highlighted in an article in the September 1983 issue of The Micro User magazine that stated, “to pick up the software off the air you need a Model B, an ordinary TV set and a teletext adapter costing £196.”34 Although the cost of the adapter was nearly half the cost of BBC Micro Model B, users were interested in its potential and the links to the teletext system they had accessed prior to the release of the machine. Downloading software via telesoftware systems did not require any additional knowledge beyond how to execute basic microcomputer commands and how to understand the language of the pages, in addition to magazines that users had already grasped from standard teletext services. However, despite some of the hype surrounding the potential use of the system, and the marketing rhetoric of simplified, convergent systems, telesoftware did have a short life. The BBC’s own telesoftware service ran until 1989, when it became a victim of BBC savings. In the announcement outlining the closure of the telesoftware service in 1989, the BBC were keen to state, “Telesoftware was devised to provide software support to the BBC Micro in the early days, particularly in relation to Education programmes. It has always been a minor adjunct to, and not an integral part of, the BBC’s commitment to the BBC Microcomputer.”36 The report continued to note that in May of 1989 sales of teletext adapters showed there to be just over 31,500 in domestic use, representing roughly 7% of the BBC Micro users as a target audience. These figures were disputed in an article in the October 1989 issue of The Micro User magazine with the “head of Ceefax, Blair Thomson [saying] this was one of the least popular Ceefax features, but telesoftware manager Jeremy Brayshaw disagreed.”37 The closure of the telesofware service also led to some disgruntled users writing in to the letters pages published in the same issue of The Micro User, where comments were made such as “I am sure I am not alone in saying my only reason for buying a teletext adapter for my BBC Micro was so that I could receive the programs broadcast in the form of telesoftware. We have a teletext television set so my adapter becomes redundant.”38 Despite the uptake of the system by some members of the public, telesoftware did not prove to be a viable service, yet its history shows how this innovation enabled ways of expanding the television set in ways that are more commonly found integrated into these systems today. Although it was used for a relatively short amount of time, the concept of telesoftware in the 1980s demonstrated the possibility of interactive connectivity via the home television set. However, the emergence and success of the Internet enabled people to access similar content in new ways. For the BBC, the viability of services such as telesoftware became no longer cost effective. The cost of adapters alongside the cost of the microcomputer meant that the system was generally not seen as an attractive additional option by home users. In contrast to telesoftware services, teletext as a system did experience some growth in the early 1990s.39 Some teenagers used ITV and Channel 4’s Teletext services as sources of information for news, pop culture, etc. Despite these uses of teletext, other contemporaries had already experienced it as having “blocky graphics” and looking “severely dated.” Teletext services were phased out by many British television stations, including the BBC, in 2012. Whereas mainstream histories can often focus on media developments of the masses, this media archaeological approach to teletext and telesoftware exposes other neglected histories of television such as home information technology. As a one-way source of information, teletext and telesoftware can, in many ways, be seen as precursor technologies to our current generation of smart televisions that allow for networked connections to other television services, apps and games. Yet it is these cycles of media change that allow us to trace the many histories of televisions and to expose the otherwise lost trajectories of technological developments that were sparked by national innovations, political and technological climates, product marketing and consumer habits. As this final video of Ceefax in its last broadcast days shows, teletext was an interesting experiment in how the public understood and experienced the use of databases, pages, and magazines in a televisual logic of distributed content. Alison Gazzard is a lecturer in Media Arts and Education at the London Knowledge Lab, UCL Institute of Education, UK, and has published on location-based media, video game spaces and time, and British computer game histories. Her current research interests include platforms, media archaeology, game preservation and the use of archives in game creation.